While an ongoing liquor license shortage and confusing laws continue to be a headache for Utah restaurant and bar owners, those who make beer, wine and liquor here are enjoying what could be considered an almost friendly business climate. The Utah Department of Alcohol Beverage Control [UDABC] has allowed local distilleries and breweries to sell their own products on premises since 2008, and last year made it legal for them to do so on Sundays and holidays. (Days on which Utah State Liquor stores remain closed.) As a result aspiring brewers, vintners and distillers have popped up in Utah from north to south offering a selection of beer, booze and wine as unique and inviting as the state's amazing landscape. Following is a guide to homegrown Utah imbibery, conveniently broken down into the state's four distinct geographical areas: Park City, the Salt Lake valley, Ogden and southern Utah. 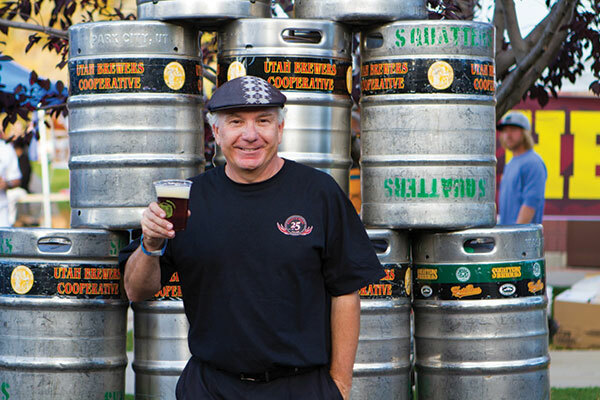 In the mid-1980s Wasatch Beers' Greg Schirf realized he needed to introduce his product to the public in a more direct way than the liquor store. He'd gotten a taste for the new brewpub concept while visiting friends in Seattle, but when he went to the UDABC to get a license to open his own here in Utah, the permitting was non-existent. So, with help from Park City attorney Gordon Strachan and state legislators Glen Brown and Mike Dmitrich, Schirf got Utah's first brewpub law passed in 1989. He opened the Wasatch Brew Pub & Brewery on Main Street in Park City's Old Town later that same year, where it remains today and with a very popular following. Down the street Georgia-born biochemist David Perkins opened the world's first and only ski in/ski out gastro distillery in the historic National Garage building in 2009. The High West Distillery & Saloon is now one of Park City's busiest eateries—patrons regularly wait an hour or more for a table during the winter high season—and its whiskeys, vodkas and ryes have been recognized both nationally and internationally. High West operates a second location at the Salt Lake International Airport. (Another and much better reason, to get to the airport early.) And last fall High West broke ground at the Blue Sky Ranch in tiny Wanship on what they're calling the world's only luxury guest ranch and whiskey distillery. The project is scheduled for completion by December 2013. Park City's newest brewer is Shades of Pale Brewing Company, a small, American-style craft brewery launched in 2012 by Trent Fargher and his wife Alexandra. Each bottle outlines a hike, backcountry ski route or bike ride that's a Fargher personal favorite. Shades of Pale beer at the brewery, is available on tap at Drafts (in the Westgate Resort at Canyons base area) and at one of Park City's most beloved watering holes, No Name Saloon. 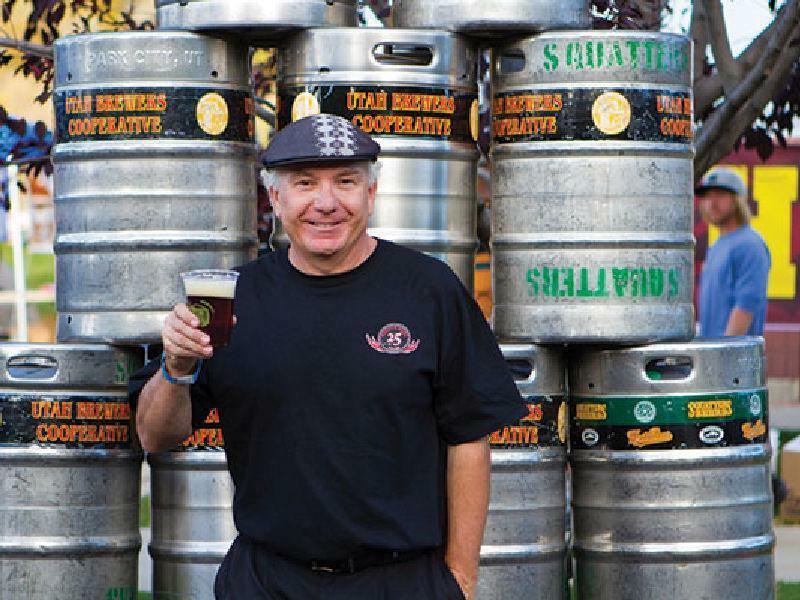 In 1989—the same year Greg Schirf opened his Wasatch Brew Pub in Park City—business partners Peter Cole and Jeff Polychronis opened Squatters Pubs & Beers just west of downtown Salt Lake City. "We knew this building as the Jazz Ranch, which was a great place with really great food, ahead of its time really. So when the space opened we jumped at it, even though one banker told us he wouldn't come this far west without a bodyguard," Polychronis says. Business was brisk from day one and actually ran out of beer the first few months they were open and had to sell Wasatch Beers until they could make more. 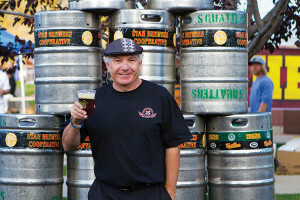 Squatters has since opened brewpubs at the Salt Lake International Airport and in Park City in the old Mt. Air Café building. The Utah Brewers Cooperative Beer Store sells both Squatters and Wasatch beers. Named after Utah's east-west mountain range, Uinta Brewing Company has been making suds in Utah since 1993. Uinta distributes is flagship Cutthroat Pale Ale, King's Peak Porter and Golden Spike Hefeweizen to 24 states nationwide. Buy Uinta beer at any convenience and grocery store in the state or stop into downtown's Beerhive Pub on Main Street where you can keep your bottle of Uinta cold from the first quaff to the last on the bar's signature ice strip. EPIC Brewing Company made a splashy debut in Utah in 2010, gaining quick traction for their high-alcohol experimental beers. EPIC brews pair particularly well with the chile Colorado or legendary mole poblano at the Red Iguana, two locations downtown. Four other notable valley craft breweries offering very drinkable, thirst quenching beers served with simple yet flavorful and satisfying pub fare include Red Rock Brewing Co., the Desert Edge Brewery, Bohemian Brewery and Hoppers Grill & Brewing in Midvale. For those with a taste for grape versus that of barley, malt and hops, Kiler Grove Winegrowers has operated Utah's first urban winery and tasting room since January 2011. Kiler Grove grapes are grown on ten acres in Paso Robles, California and brought to Utah where they are used to make this winery's surprisingly sophisticated Rhone-style wines. Try the 2009 Trebbiano (lovely with grilled fish on a summer evening) or the 2007 and 2009 Zynergy. Johnny-come-lately brewers promising to open their doors later this year include: the new Bonneville Brewery in Tooele, formerly Tracks, scheduled to open near Utah's iconic Salt Flats. But you can sample Bonneville's beer now at All-Star Bowling and Fun Center's three locations. The Jack Mormon Brewing Company is already busy branding their coffee stout on Facebook; and the Avenues Proper Restaurant & Publick House a nano-brewery (Even smaller batches than a micro brewery) headed up by EPIC Brewing defector Rio Connelly. Many of Utah's beers can be enjoyed at the Porcupine Pub at the mouth of Big Cottonwood Canyon, a popular spot for après ski, après mountain biking, après hiking, après enjoying the canyons. Rooster's Brewing Company on Historic 25th Street brews more than 26 unique beers including Two-Bit Amber, Bees Knees Honey Wheat and Chocolate Stout. Good beer needs good food and it's the lunch and dinner menu that really sets Rooster's apart. Along with pub staples like burgers and pizza, Rooster's offers high-end specialties like steak served with a cabernet demi glace and fresh house made ravioli. Rooster's is also in Layton and a popular spot after recreating on Antelope Island. Ogden's Own Distillery realized the maxim there's no such thing as bad publicity. Last spring the Idaho State Liquor Division banned its Five Wives vodka. "We feel Five Wives Vodka concept is offensive to a prominent segment of our population and will not be carried," Howard Wasserstein, deputy director of the Liquor Division, explained in a letter to distributor Elite Spirits of Boise. Ogden's Own took legal action against the ban and is now allowed to sell Five Wives in Idaho State Liquor Stores, but only by "special order." Not a slam-dunk reversal per se, unless you consider the media coverage generated by the fracas that included hits on huffingtonpost.com, NPR and ABC News. 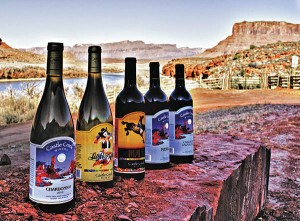 Red Cliffs Lodge on the Colorado River outside Moab is a coalescence of two seemingly very different worlds: prototypical Western hospitality and wine making. 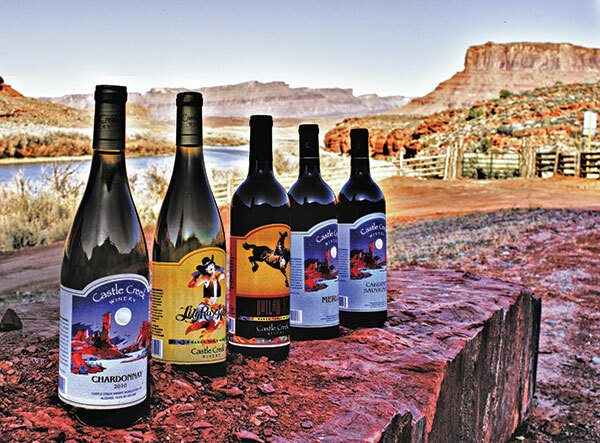 Southern Utah's hot days and cool nights provide ideal conditions for wine grape growing and more than 6,000 gallons of award-winning pinot noir, merlot, cabernet sauvignon, syrah, chenin blanc and chardonnay wines are produced at the lodge's Castle Creek Winery every year. The lodge offers wine tours and daily tastings from noon to 6:30 p.m.
No mountain bike ride, hike or day on the river in Moab is complete without a post-adventure cold one at the Moab Brewery. Popular varieties here include Dead Horse Ale, named for the scenic overlook near Canyonlands National Park; Scorpion Pale Ale, Derailleur Red Ale, Lizard Ale, Over the Top Hefeweizen, and nitrogen-conditioned Raven Stout. Moab Brewery tasty beers are also available way up north at Logan's Beehive Grill and now in four-pack, 16 ounce cans in stores. Salud! Prosit! Skoal!